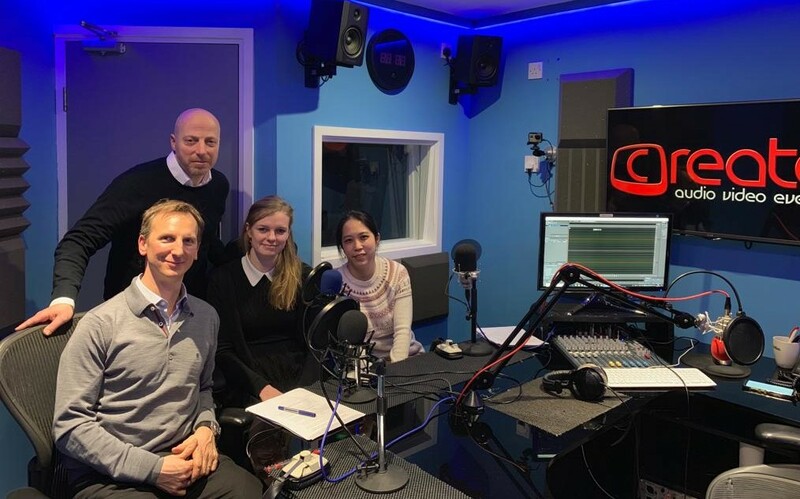 Show 77 was produced in partnership with British Business Bank, Diversity VC and British Private Equity and Venture Capital Association (BVCA) to coincide with the release of a new report from all three organisations, commissioned by HM Treasury, which highlights the fact that female start-up founders are missing out on billions of pounds of investment. The research identified specific barriers faced by female led firms in accessing venture capital and its aim is to help inform ongoing government work to tackle these barriers and boost the untapped economic potential of businesses. David Mott, Chair of the BVCA’s Venture Capital Committee and Founder Partner, Oxford Capital. Alice explained that the British Business Bank is the UK Government’s Economic Development Bank that looks after increasing access to finance for small and medium sized enterprises in the UK. She said that last year, HM Treasury commissioned a piece of work with regards to patient capital or how to get increasing amounts of long-term capital for innovation to UK small businesses. As part of that, venture capital (VC) is a critical element and so they looked at not only the supply of capital but also where it was going. British Business Bank wanted to look at specifically at whether VC got to female founders and so turned to the community of VC firms that they know. Forty-Five VC firms stepped forward to provide anonymous data on the gender makeup of founding teams that they had had contact with, first when the founders pitched themselves and presented to them for the first time and secondly at investment committee when the VC firms decided whether or not to allocate capital. By looking at these two decision points, the Bank sought to see what the makeup was of female founded or mixed gender companies throughout the process. Overall the firms in the research sample represented more than £13bn of assets under management. 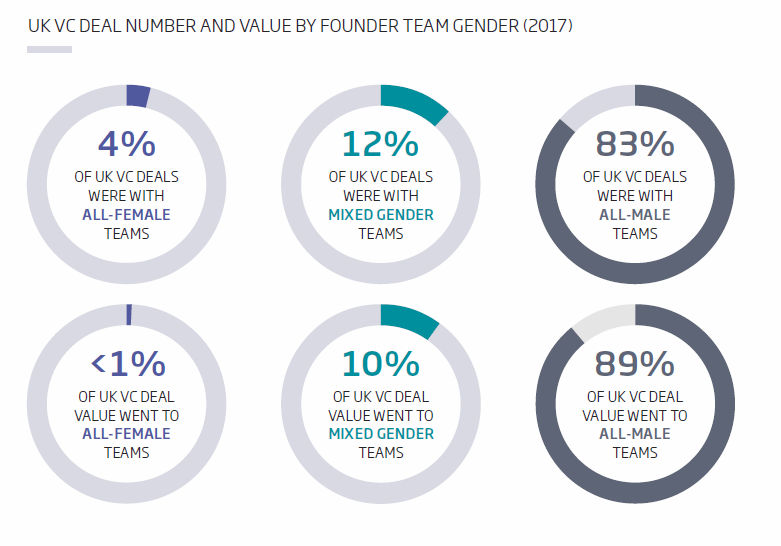 The headline statistic in the report is that, of the £5.6bn of venture capital invested in 2017 in the UK, 89% went to all male founder teams. Alice commented that on one level operating in this sector, you can’t help seeing how male dominated it is, although she was shocked by quite the scale of it. Look at how VCs themselves can be more inclusive. The organisation looks at all of the drivers of inclusion and all kinds of diversity. Check said that one of the things that is quite disappointing for her was how little the numbers are actually moving over time adding that all-female teams [accessing funding] has only seen a 2% increase over the last 10 years and she feels that the industry needs to get much better at making targeted interventions now, in order to make sure that that number doesn’t just continue to move as slowly as it is today. David explained that the BVCA is as a member led organisation with 750 members who represent venture capital firms, private equity firms and institutional investors. As an industry body, he said that their mission is to try and use their resources and their position as a trade body to encourage discussion and to encourage inclusion across all aspects that their industry faces. Check added that typically, according to the research Diversity VC carried out with the BVCA, the size of the VC companies themselves are very small – around nine people on average, and so often they don’t necessarily have the internal resources to put lots of time and energy and funding into this. However, she said that bodies like the BVCA and to an extent what Diversity VC are doing, are trying to centralise the resources, the time, the research, the energy, so that they can make that available for the whole industry. According to the report, only 13% of senior people on UK venture capital investment teams are women and 48% of investment teams have no women at all. Check said that one thing that has come through in the report is that it looks like the funds which have a female decision maker or female partner actually attract a higher level of deal flow from all female and mixed gender teams. However, she didn’t want to just imply that you have to have a female partner to see if you have valid companies, because anyone can invest in great businesses and actually, she didn’t think it would help the issue if they were just looking at [the number of] female partners in funds. Alice added that one of the key takeaways of the research is that it highlights how the venture capital industry works. She said that it works off of networks around people that you know and that what they see with female VCs is that, in general, their networks might be slightly more likely to contain other women. However, she agreed that there isn’t any requirement that says someone who isn’t female can’t have women in their networks and so she believes what is important, given the critical nature of warm introductions for the industry, is that it behoves venture capitalists to look at their networks and be more open about them, to be more inclusive in the broader sense of having their networks reach out to people who don’t necessarily look like them or are not from the exact same backgrounds because it’s good business, because a richer more diverse network will originate better transactions. Check felt that warm introductions, in general, is an antiquated way of actually receiving deals and actually, if we had a system where you didn’t have to know someone in the network for VC and you could just approach any VC, then you would see a more diverse pipeline of companies. The VC and Female Founders Report shows that warm introductions are 13 times more likely to reach an investment committee and be funded than cold submissions but only 36% of all female teams have a warm introduction compared to 40% for mixed gender and 42% for all male teams. David explained that in terms of venture capital funds, the due diligence starts from the moment an opportunity comes through the door and if come through a warm introduction, then it’s a massive step up in the due diligence, and if it comes from someone who you trust, it makes a big difference. However, he agreed that it does sound like a bit of an antiquated way in this era of social media and mass data and he said there are a few examples of firms that are trying to use more data focused approaches. However, he said that the reality is that today, it is a network-based industry and so the question is how do we help more female founders access those networks and feel less intimidated? The unconscious bias [of the investment team] – who do you think looks like success? Do you want to be challenged because you made a bet on someone who is non-typical and doesn’t look the same versus someone who looked typical and so when it failed, well you couldn’t have known! Check said that it’s on the VC to go and build their network in unusual places. Referring to the report, she said that a quarter of the funds in their sample did not see a single woman in investment committee last year. She therefore wants to see those funds going out and having open offices hours where anyone can sign up and come along. Alice said that this is a wider diversity and inclusion issue than just gender but that they started with gender because that was what was commissioned by HM Treasury for the purposes of this research and because gender is relatively straightforward to assess in a world with data privacy issues. However, they are very conscious that diversity does not stop at gender. She said that there are people who are white males who come from working class backgrounds, for example, who are equally or even more severely at a disadvantage in the classical sense or who have disabilities or people of colour and so on and so forth. She was clear to point out that they didn’t want anyone who’s listening to the podcast to think that this is purely about gender. It isn’t, but it’s just that gender is a good place to start. Check added that taking an intersectional approach to this is really important. David said that diversity is an issue that is not just a board level issue and that it’s very much coming out from millennials, the new generations in the venture capital firms. Finally, Alice said that British Business Bank is not only a domestic development bank but is also the largest institutional investor into UK venture capital in this country. She said that they care about the venture capital industry in the UK overall being healthy because it is able to prove to the world that it makes world class returns and that they believe that diversity and inclusion is essential to that. 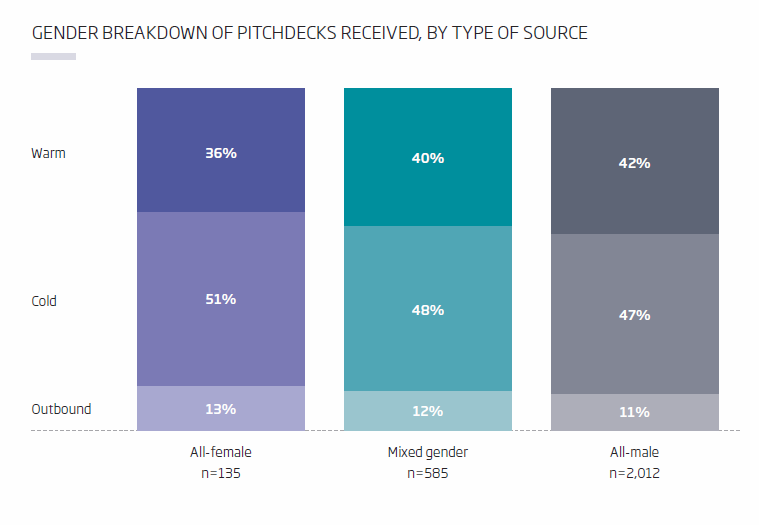 According to the research, 75% of pitch decks that the industry receives are from businesses with no women on the founding team and that pitch decks from all female founding teams make up just 5% of all approaches. Check therefore feels that the issue needs to be addressed all the way through the funnel, but she didn’t want to prioritise any aspect of intervention above another. However, she said that the research only looked at those companies that had already submitted their pitch decks to the VC funds and not before that point and so may not have taken account of those companies that said ‘actually I don’t think that sounds or looks like the kind of thing for me, that doesn’t look like something that’s suitable for my business. I can’t see anyone else who looks like me who’s gone through this process before’. She therefore thinks that it’s up to VCs to become more attractive options for every kind of business and for VCs as an industry to highlight the stories of the companies that get funded that do well that are not the sort of typical profile of what we would class today as a venture backed business. David added that the venture capital sector is a really long-term industry that thinks in terms of decades and their typical funds could go on for 12 years or more. He said that small changes that are made today are going to have big impacts in the future. A seed stage investment today of a million pounds could start a journey for a company that becomes a billion-dollar business in the future and that will create a lot of new entrepreneurs as people enjoy the taste of success and want to repeat it. He said that repeat entrepreneurs always come out of success along with angel investors and the next generations of VCs. Therefore, small changes to increase the number of female entrepreneurs, the number of female founders and the number of women in VC are going to have big impacts in the future, which will create the role models and the stories of success that others will follow in the future. David said that the number of women working in the venture capital industry itself is clearly too low and that women have limited opportunities to being promoted and reaching the partner level. Check added that how people get into the VC industry is a really opaque issue at the moment. She said that there is no such thing as a milk round for VC and instead it’s all about “oh, I kind of had coffee with someone and then they introduced me to someone else”. She therefore wants it acknowledged that that’s the case and then look at how the industry can make more interventions around education and also talk about what it takes to be a great VC, because there isn’t one template. Check wants to hold people accountable to what they’ve committed to in the report and at the 45 funds that have talked about the interventions that they’re making. She also wants to see more training and highlighted that Diversity VC have created a toolkit for VC funds, which helps them look at their VC business and break it down and look at what the sourcing strategy should be, what they should be doing around hiring and onboarding people, what the culture should be and then giving people really tactical advice about ways that they can change their processes to become more inclusive. David said that the BVCA wants more member firms to submit data and try and raise the degree of transparency around this issue as much as possible, promoting the resources and showcasing best practice and giving practical, simple advice. They are also running a number of events including their Diversity conference and ‘women in private equity breakfast’. Check also said that VC have a district disproportionate impact on the companies they fund and actually the culture and the point of view in the attitude towards diversity and inclusion that the VC has will actually percolate down into the companies that they fund. She believes that if we get this right within the companies that the VCs are funding, then that will have an amazing impact on the number of diverse and female executives that are coming through and they can become the founders of the future. Alice agreed and said that the impact is not just on the [tech] sector, but also on the country as a whole. She said that the VC led companies are the stars that the rest of the sector look up to and so they are the role models, they’re the ones that grow the fastest and that supposed to be the world beaters. Therefore, it’s not only a disproportionate impact upon [the tech] sector but also a disproportionate impact upon the country as a whole, particularly with regards to certain key sectors for our society. David also wants VCs to open up the idea of taking on interns, which he said his company has had a lot of success with, having taken on well over 100 interns over the last 20 years, made up of an extraordinarily diverse group of people. He also said that they have had interms come in at a returning to work stage – typically mothers who’ve had successful careers, who’ve taken some time out to raise their families and now want to come back into the industry. He feels the internship is a real win-win in terms of giving people the opportunity to prove themselves and learn and get back into the work and also for the firm to test the candidate over time, which can lead to people either staying on in the firms or finding roles in other firms. For Alice, the key message is to get involved but specifically, she think that it would be great for the venture capital industry as a whole to commit to saying that, first of all, this matters and then second of all, to actually back that up with collection of data, which is absolutely critical, and to share that – secrecy abounds but nevertheless – and to connect with other people and not think that you have to reinvent this. You can download the VC and Female Founders Report from the British Business Bank website. All previous shows of the series are available on this website as well as Soundcloud, Spotify, iTunes, TuneIn, acast, Google Podcasts and Stitcher.